Thanks to Andy Clayton & Roger Deeley for sorting out my very sick Puter. I hope to resume normal service this month. It is sad to see the Typhoon T3’s being wfu after only 12 years in service with ZJ815 already been reduced to spare parts, ZJ808/BP is on RTP and ZJ806/BE & ZJ814/814 are the next two for the RTP line. Please note I had my e-mail address kevin_mape@hotmail.com hacked and it has been shut down, My new e-mail address is kevin_good123@hotmail.com. It took Microsoft 5 hours to sort it all out. 1st Tue Log thanks To Steve,Val and Dawn Rhodes. “Warlord 12” – Ground abort. “Rampage 44” – ground abort. G-MAJA/JA/Eastern/Jetstream 41 c/s “East Flt 102” in “103” out. ZK335/335/41(R)TES – Noted on the Wash pan. ZJ920/920 code only – HAS1 to HAS2. 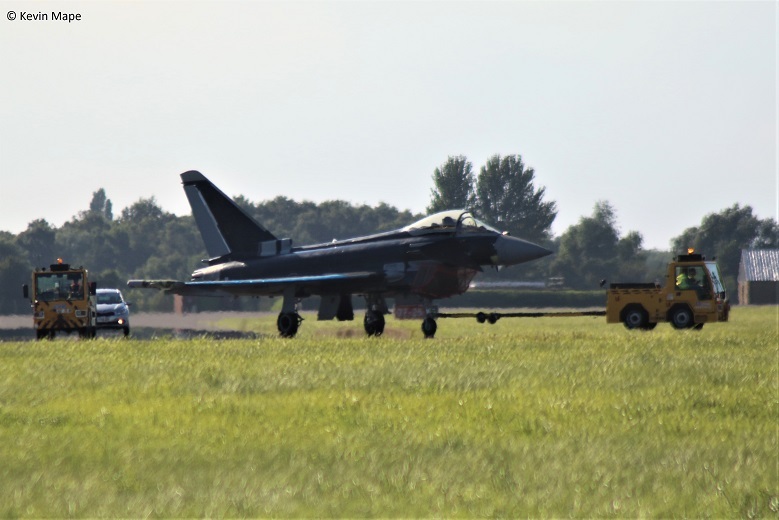 ZJ800/BC/29(R)Sqn c/s “Typhoon 45” – Display. ZJ917/917 code only – QRA radio check. 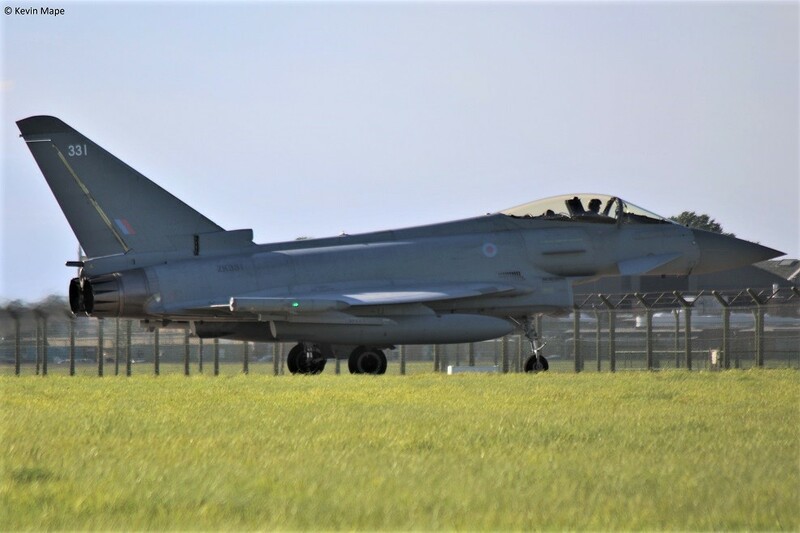 ZJ935/935/XI(F)Sqn – Moved from South side TMF to North side TMF. G-MAJA/JA/Eastern/Jetstream 41 c/s “East Flt 104” in “105” out. G-MAJA/JA/Eastern /Jetstream 41 c/s “East flt 102” in “103” out. ZF172/172/1FTS/Tucano T1 c/s “LOP 17” – Overshoot. G-MAJD/JD/Eastern/Jetstream 41 c/s “East flt 102” in “103” out. 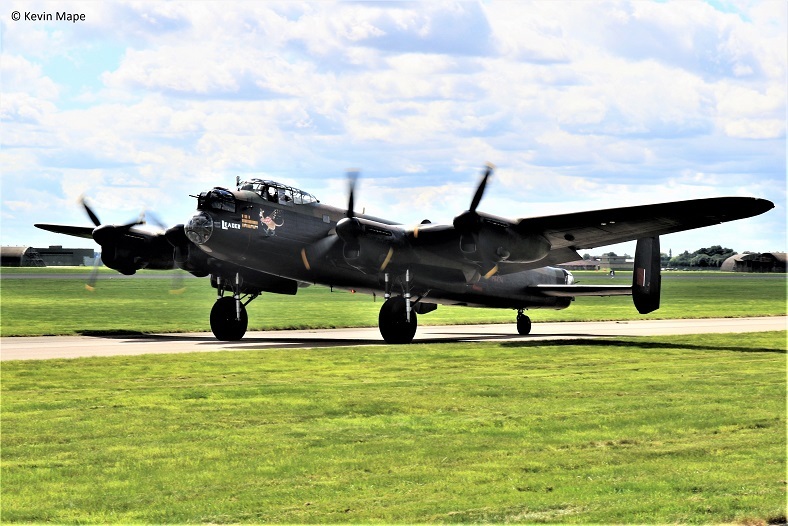 PA474/Lancaster BI c/s “Memorial 1” – To East Kirkby, Night stopping at Blackpool. N0.064/YY/EAT00.319/EMB – 121AN Xingu c/s “Cotam 1777” – Parked on Sierra. ZK458/D/45(R)Sqn/King Air B200GT c/s “Cranwell 66” – Overshoots. 8th Tue Log thanks to Steve & Val. 9th Wed Log thanks to Susie. – Welcome back. ZK4**/*/45(R)Sqn/Kingair B200GT c/s “Cranwell 62” – Overshoot – Poppy marks. ZJ232/Apache AH1 c/s “Panther 80- Parked on Sierra for fuel stop. G-MAJD/JD/Eastern/Jetstream 41 c/s “East Flt 105” in “106” out. ZJ946/ All black – Towed from TMF to the South side. Noted outside BBMF – TE311. PA474. AB910. 14th MonLog thanks to Susie. ZJ236/X/ 60(R)Sqn/Griffin HT1 /c/s “Shawbury 94” – Parked on Sierra – Fuel stop. **-****/LN/48FW/F15E c/s “Dark 01” – Overshoot. 15th Tue Log thanks to Susie. 29sq; 343, 930, BG, 812, BY, BV, 349, 341, DR, BC, 924, 807. G-MAJD/JD/Eastern/Jetstream 41c/s “East Flt 104” in “105” out. ASP 29sq DR. BC. 807. BV. 924. BY. 812. BG. 930. ZJ236/X/60(R)Sqn/Griffin HT1 c/s “Shawburry 97” – Parked on Sierra. ZK325/325 code only on QRA but mission abort. 16.30 departures 29Sqn call signs in XI(F)Sqn jets. ZJ935/935/code only – Noted on the Washpan. ZK334/A code only in Triangle c/s “Jedi 12” – Parked on the ASP for TMF. XW216/Puma HC2 c/s “Vortex 048” – departed. 18th Fri Log thanks to Susie. Noted on washpan – ZJ917/917 code only. 84-0044/LN yl/48FW F15D c/s “******* 51” – Overshoots. PS915/BBMF/Spitfire PR XIXe c/s “Spitfire 90” to Biggin Hill. ZK347/347 code only – c/s “*******” – To Echo. PS915/BBMF/Spitfire PR XIXe c/s “Spitfire 90” – Return from Biggin Hill. 21st Mon Log thanks to Susie & Mark. ZH901/Chinook HC5 c/s ” Ultimate 02″ – Parked on the ASP from Cosford . ZH903/Chinook HC5 c/s “Ultimate 01”- Quick drop off on the ASP then Departed. ZJ276/76/DHFS/Squirrel HT1 c/s “Shawbury 35”- short stay on Sierra. E-163/705-RB/EAC00.314/Alpha jet E c/s “French Air Force 6442” Overfly to Midenhall. 28th Tue Log thanks to Steve & Val. ZJ946/EJ code only – Noted doing APU runs in the TMF Tunnel. ZK302/302 code only – Towed from Echo to Hanger 2. ZK371/Unmarked – Engine tests on the ASP – then back to TMF. ZK342/342/6Sqn c/s “Rafair 7001” – To Echo. ZJ800/BC/29(R)Sqn – From Hanger 1 to Wash pan. ZJ929/929 code only QRA radio check. ZF290/290/1FTS/Tucano T1 c/s “Cranwell 09” – Departed to Cranwell. ZK342/EI code only – APU runs in TMF Tunnel. G-MAJD/JD/Eastern/Jetstream 41 c/s “East Flt 104” in “105” – out. ZK315/41 100 year special c/s “Apollo 21” – Ground abort. 30th Wed Log thanks to Garf. 50+40/C-160D Transall c/s “GAF 104” parked on Sierra. Unloaded then departed. ZA559/049/41(R)TES/Tornado GR4 c/s “Rebel 87” – To RTP Leeming. G-BGCO /BAe Warton/Pa-44 c/s “GBGCO” – Crew ferry. ZK361/unmarked c/s “Tarnish 29” – Delivery from Warton. 31st Thur AM Log thanks to Howard Curtis. ZA559/049/41(R)TES/Tornado GR4 – Noted on the ASP. ZK353/BQ code only – Noted in Foxtrot. PM Log thanks to Garf. ZH875/Hercules C5 c/s “Ascot 188” – overfly. 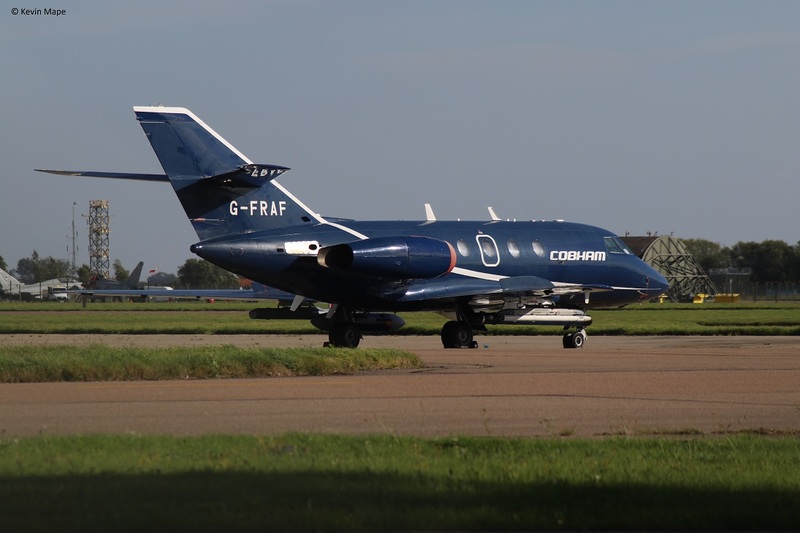 ZJ917/917 code only c/s “Y9 6 32” – QRA practice. Lancaster BI : PA474 – Active. Spitfire Vb : AB910 – active. Spitfire LF XVIe : TE311 – Active. ZK301 : All black : – Noted towed to the Southside for engine runs. 10/8/17. ZK361 : Unmarked : Arrived 30/8/17 as “Tarnish 29”.